A passion for collecting vintage cars can be as frustrating as it is rewarding. What with finding the right make and model in perfect condition at a decent price and negotiating the sale can be time consuming as well as flat out tedious. If nothing else, it certainly requires a degree of dedication to frequent vintage car auctions with high hopes of coming away with the car of your dreams. True, a lot of work but once accomplished, the car is yours. You can put it in the driveway on sunny Saturday afternoons so the neighbors can watch you wash, polish and hand wax. You can cruise through town and quietly hear the oohs and ahhs of onlookers and you can be content knowing that you have a one-of-a-kind masterpiece of a time gone by. 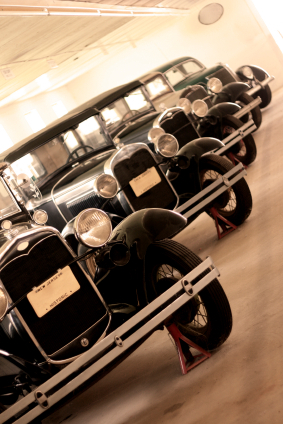 Vintage cars are considered to be models built between the beginning of 1919 and the end of World War I, roughly 1925-1930. Investors in vintage cars look for the rare and exotic cars that have not been modified or upgraded in any way and as experts, they focus on period cars that are high value rather than choosing according to sentiment or personal tastes. Vintage cars purchased for investment purposes require the same high maintenance as those bought for pleasure and the value must be protected through specialty insurance policies and storage facilities to maintain their book value. The Royal Malaysia Vintage and Classic Car Club goes one step further as it pairs a passion of vintage cars with events to support charity. Club members recently put on view about 20 classics including a Jaguar MK 2, a Mercedes-Benz 300 SL and an Austin A40 to raise funds for the disabled. Besides receiving donations, the disabled also had the pleasure of joining the Annual Charity Wheel-a Thon as privileged passengers while the vintage cars made their way through town. Indeed, a fun and worthwhile event. Collecting vintage cars is a hobby of car enthusiasts who love to collect rare cars, as vintage cars are not manufactured now so if someone wants them then it will cost higher, both investment and charity is good in vintage cars, investment has profit value and charity has moral value. Some people like to have the vintage vehicles. And usually these cars can be worth some money after a long time. If you drive a vintage car, be sure you will get attention. If you have extra money, investing in the vintage vehicles is a good idea. Who can forget these models. It is nice to remember these models with this blog. Though it has got a old style, I has its own uniqueness. In the first paragraph the way a vintage car is selected is described in a short, precise but in a convincing manner. A manner in which even a layman can understand. This is followed by the time period between 1925-1930 when the vintage cars were made and finally in the last paragraph the vintage car rally in Malaysia and how it has benefited the disabled by raising funds. Great work. your article provide more good information about the vintage cars. Good to know that vintage car events and the persons who are conducting the events will give donations to the charity people. I think vintage car is good to take in auctions. Vintage car is very expensive here in our country. Mostly top 40 riches people in Philippines have this car. I'm always amazed everytime I saw a vintage car in the road while I'm going in the main city. Its really beautiful classic car. Its so nice to read this article that the vintage cars can help for the charities. I definitely have an idea for this. Passion for vintage cars can be expensive. However, it can prove to be so rewarding. I think this passion can really be developed further for all enthusiasts. Good Article for Vintage Cars. Before reading this article I didn't knew about the Vintage cars. Also I am happy by reading that there are vintage car events for Charity.